Calibrate proved too strong at Kilmore this afternoon when victorious for Mornington-based trainer Tony Noonan. 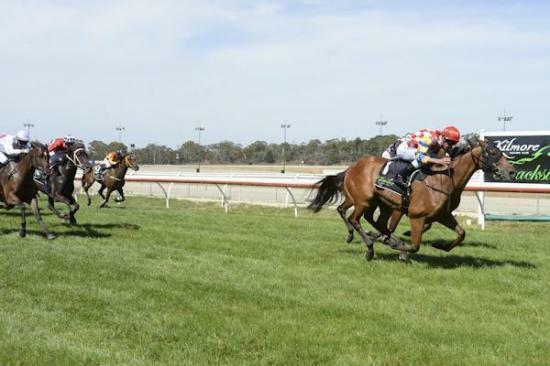 The victory was the third of the week for the Noonan stable which has been on fire over the past month chalking up victories all over the State throughout December and their second of January – just four days in. “He (Calibrate) has been knocking on the door in his trackwork but hasn’t had a lot of luck lately,” said Alfred Chan, Racing Manager for Tony Noonan. “Tony’s been training him as a downright stayer this prep so we knew he wouldn’t be at his best until he got out to a mile and beyond, and he got that chance today. Jumping from barrier 2, Arnold settled Calibrate ($4) midfield along the rail as early speed in the 1600m race ensured it to be run at a genuine tempo. Upon straightening, Arnold shifted the 5-year-old Reset gelding off the fence and looked the only horse capable of winning as he cruised to victory ahead of Very Sauve ($3.60F) and Marlais ($5) in third. It was a welcome return for Noonan to his old stomping ground of Kilmore where he taught at Assumption College prior to commencing his training career.